I wasn’t sure if I would like this book or not because it’s not my usual genre. Even though I have branched out a lot in the last few months, it just didn’t seem like the type of story that I would appreciate. So colour me surprised when I found myself flying through this book without pause. 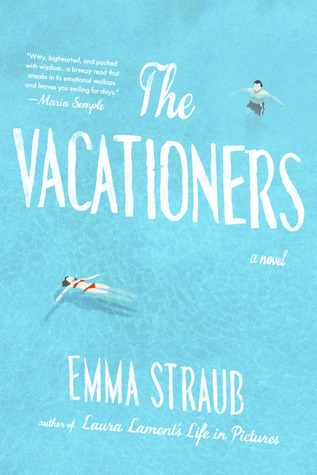 Synopsis: The Vacationers is about a family vacation that is also happening in the in the middle of a family crisis. Jim and Franny Post have been planning this vacation with their children and friends for many months, and nothing is going to stop them from trying to enjoy their time in Mallorca, because this may be the last time they are all together. Everyone on this vacation has secrets they are keeping from each other, but it’s nearly impossible to keep a secret in the close quarters of their island retreat. Straub uses many different viewpoints to share this story, and it can be a bit confusing at first when you are suddenly thrown into the thoughts of a different character without warning, but eventually you get into the narrative flow. The voices are all distinct enough that you will start to recognize who is talking fairly quickly. The overall conclusion of the book was definitely satisfying. Everyone’s story was wrapped up nicely, which can be tricky in a book with this many characters to follow. Maybe some of the resolutions were too simple, but overall I think they fit the characters personalities well. This is a simple, beachy read that will appeal to anyone who is looking for something light and entertaining.